Now that the Met’s 2013-2014 season has been published and almost immediately discussed to death, La Cieca thought it would be amusing to do a bit of speculation about what lies ahead as we approach the middle of the decade. An assemblage of gossip and guesswork about the 2014-2015 season follows the jump, and won’t it be fun to look back on this post next February when the official announcement is made? The Met’s 2014-2015 season will open with a new production of Le nozze di Figaro, a production that is in a bit of flux at the moment since Anna Netrebko has elected not to add Contessa Almaviva to her stage repertoire at the moment. As it stands now, the new Mozart will be conducted by James Levine in a production by Michael Grandage. “Heading” the cast will be Maija Kovalevska, Marlis Petersen and Mikhail Petrenko. Iolanta/Duke Bluebeard’s Castle. Conductor: Valery Gergiev. Director: Mariusz Trelinski. Cast includes Anna Netrebko and Alexei Tanovitski in the Tchaikovksy, with Nadja Michael and Mikhail Petrenko in the Bartók. 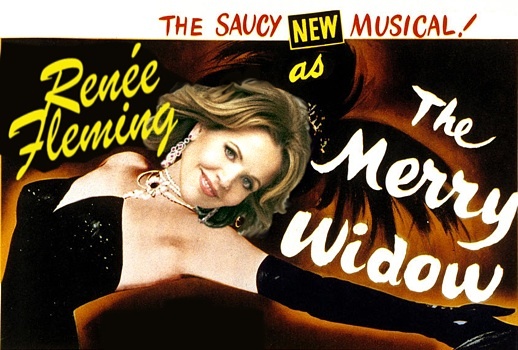 The giddy New Year’s Eve extravaganza this season will be The Merry Widow, under the capable baton of TBA. Susan Stroman directs Renée Fleming; later in the season the show returns with Susan Graham and Rodney Gilfry. La Donna del Lago. Conductor: Michele Mariotti. Director: John Fulljames. Joyce DiDonato, Daniela Barcellona, Juan Diego Florez. Cavalleria Rusticana/Pagliacci. Conducto: Fabio Luisi. Director: Bartlett Sher, with Marcelo Alvarez, Barbara Frittoli. Aida with Liudmyla Monastyrska, Dmitry Belosselskiy. Un Ballo in Maschera with Sondra Radvanovsky, Yonghoon Lee. La Boheme with Maria Agresta. Carmen with Elina Garanca/Anita Rachvelishvili, Roberto Alagna, Anita Hartig/Ailyn Perez. Les Contes d’Hoffmann with Susanna Phillips, Matthew Polenzani. Don Carlos with Barbara Frittoli, Nadia Krasteva, Jonas Kaufmann/Yonghoon Lee, Simon Keenlyside, Ferruccio Furlanetto. Chef d’orchestre for the first-ever Met performances in the original French will be Yannick Nézet-Séguin. Ernani with Placido Domingo as Don Carlo. Lady Macbeth of Mtsensk with Eva-Maria Westbroek, Brandon Jovanovich, Raymond Very. Lucia di Lammermoor with Olga Peretyatko, conducted by Maurizio Benini. Manon with Diana Damrau, Vittorio Grigolo. Die Meistersinger von Nurnberg with Emily Magee, Karen Cargill, Johan Botha, Matthew Polenzani, Bryn Terfel, conducted by James Levine. The Rake’s Progress with Lisette Oropesa, Stephanie Blythe, Gerald Finley. La Traviata with Marina Rebeka, Francesco Demuro. The cher public are naturally invited to exercise their expertise by filling in casting gaps and guessing which productions might get the axe, to be replaced (no doubt) by more reprises of Turandot.